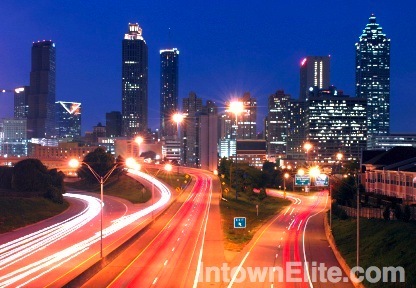 Downtown Atlanta is not only the business center of the city, but also an increasingly popular residential community in Intown Atlanta. Downtown is located south of Midtown & Georgia Tech, west of the "Grady Curve" of the connector and north of I-20. Downtown Atlanta includes a number of neighborhoods, such as Castleberry Hill, Fairlie-Poplar, Marietta Street Artery, and Sweet Auburn. Downtown Atlanta is home to the Georgia Dome, Phillips Arena, Centennial Olympic Park, the Georgia Aquarium and more.